Lately I've been getting a ton of questions on Instagram asking about my outfits or where to find the items. If you're new to following me, hello & welcome! And if you've been following me for a while, you're probably aware that everything I feature on Instagram can be found on the LIKEtoKNOW.it App. But did you know they can also be found on my blog or the LTK website? First, what is LIKEtoKNOW.it? 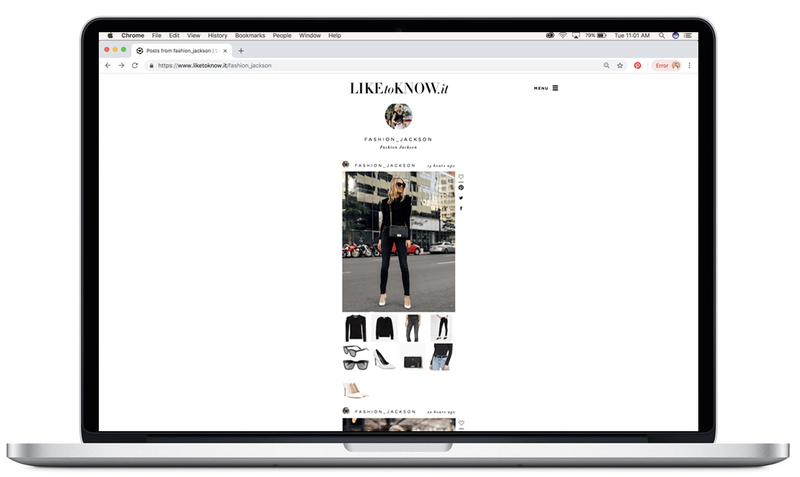 LIKEtoKNOW.it or LTK is an easy way for you to shop influencer posts! 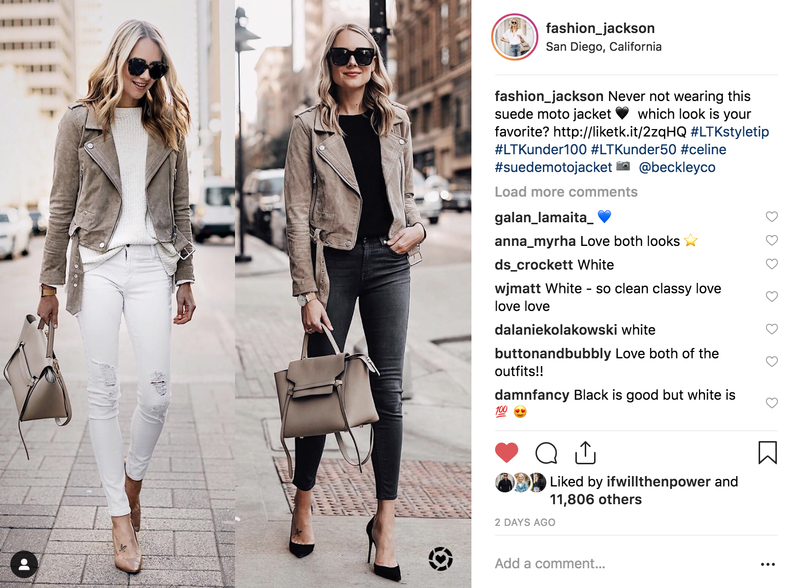 Whether it's a picture posted on Instagram, Facebook, Pinterest, etc, or exclusive content featured in the LTK App, it's a tool that allows you to directly shop the products featured from the image posted. Simply put, I post a picture, link the product details, publish on LTK, and then it's immediately shoppable for you! You'll notice that my images usually have a heart icon in the bottom right corner and the caption typically has a code like http://liketk.it/2zqHQ. This means the image has been enabled with products you can shop! I wrote this post to explain a more detailed way on how to use the LTK App, however, since technology is always updating, there are a few new features/ways to search & shop! It seriously takes less than 3 minutes to download and become familiar with using the app. Plus it's such a fun way to shop! Start off by downloading the app (compatible with Apple & Samsung) . The LTK App is free and so easy to use once you download it! There is a search icon in the bottom right corner. Tap the icon, then tap the search bar at the top - make sure to tap on 'influencer search' (this will populate influencers instead of products), then type the influencer name in the search bar ex: 'fashion_jackson'. Tap on the influencer name and then scroll through and find images you want to shop! You can shop my most recent LTK posts on my blog here. Once you find an image you'd like to shop, click the image and the product details will appear. From there you can click the item you're interested in and it will take you directly to the retailer's site. If you make any purchase from the site at that time, I will earn a commission (thank you!). It's also super easy to shop my posts directly from the LTK website, and you aren't limited to the most recent posts. It's similar to using the LTK App, however there are a few cool features you don't have access to that you do when using the LTK App (ex: you can't search for specific products, you can't save items you like, etc). FYI there are times when items I wear are old, or sell out. I will always link the exact items when available, but also similar styles if something is sold out. I tag all of my Instagram images with the brands I'm wearing for your reference too! I try to include sizing and fit details in the caption of the LTK app, but if you ever have a question, feel free to email me! I didn’t really like LTK when I used it before. I prefer using individual blogger’s blog to shop. Thanks for sharing the different options!